rue Ste Catherine, Montréal May 1st until September (Labour Day) the part of this street is closed to vehicles…streets lined with pedestrians and terraces. 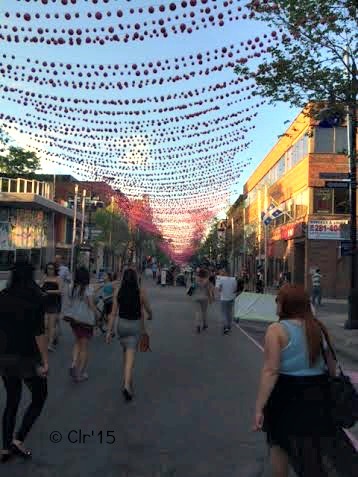 In the past two days she had attended a clinical training in downtown Montréal, to improve in her counselling techniques and brief solution focus approach. It was nice to be with colleagues that she rarely saw all at once due to varied shifts scattered over a 24 hour period. The fun part was eating out together and interesting conversation. Their hunger to learn is apparent as they want to be the best they can to help youths in need. This serene painting le poète allongé captures a touching moment in the life of Marc Chagall, one of Russia’s greatest unconventional artists and his wife Bella Rosenfeld. 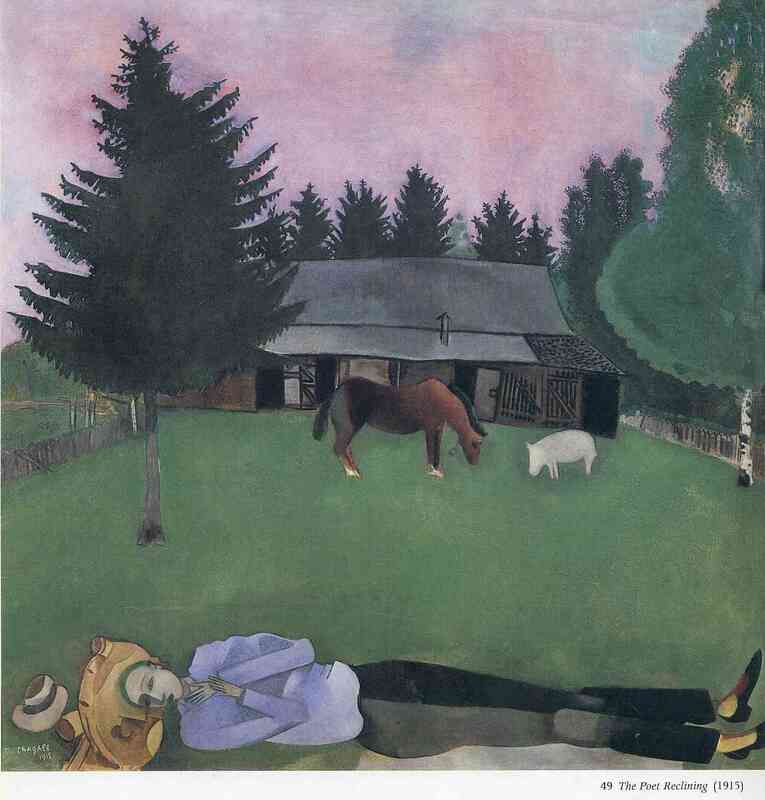 Completed during their honeymoon in 1915, it shows the artist reclining dreamily in front of the family’s dacha. He lies stretched on the grass, his body dramatically elongated, with the vast majority of the picture taken up with a violet sky and green pine forest landscape, home to a modest farmhouse and its animals. 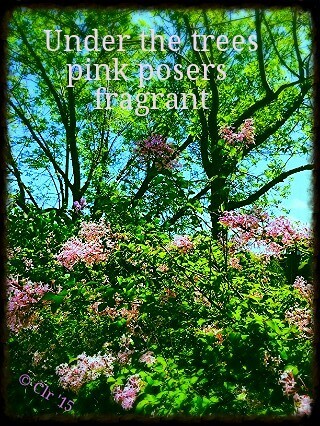 Here is my second offering in this prompt at Heeding Haiku with Ha, a positive and dreamy version. I find this interesting to have this prompt this week, seeing as Marc Chagall was born in 1887 in Russia. He moved to Paris in 1910. However, I just finished reading Please Say Kaddish For Me by Rochelle Wisoff-Fields, the author also of Friday Fictionneers. This novel takes place in Russia from 1899. I can only imagine how Chagall may have struggled with all the mayhem going on in his Mother Russia during that period. To read more on Chagall’s cubism art read here. It was a hot muggy day and she dreaded going to work. She shuffled across the street with her sunglasses protecting her sensitive blue eyes from the hot sun at high noon. Suddenly she got a whiff of those amazing lilacs on the side of the road. She had to pause briefly to take in that moment. Such a mundane experience lifted her spirits and added a bit of a lilt in her step on her way to the Métro. She stayed all night and day, as her daughter cried from the pain she too felt striking at her heart at each contraction. If only she could have bargained with the devil to lesson her agony. Twenty-four hours of labour and finally, her grandson was born. The doctor offered her the honour to cut the umbilical cord. She gasped, overjoyed with her new role. She looked up at her precious gem through teary eyes and humbly bowed in her mind’s eye at her offspring’s gift. Sunday brunch had become a tradition for these ladies. Some were divorced; a few never tied the knot and one widowed. They met at work years ago and since had all retired. For many retirement meant either long overdue travelling with their mate or slipping away into oblivion, but not these ladies. They seemed like born again “girls”. They went on road trips together, started a book club, hosted social teas, attended art exhibits and often took to the streets now and then advocating for change. She is a hugger, born and raised… a touchy feely “minouching” person. Her mother could never get enough holding her, kissing her, hugging her. Her grandmaman rocked her and embraced her when she was sick. She always thought it was an innate asset for most mothers who had birthed children to have this gift of soothing their children regardless of their age. She never did outgrow that need to be hugged. 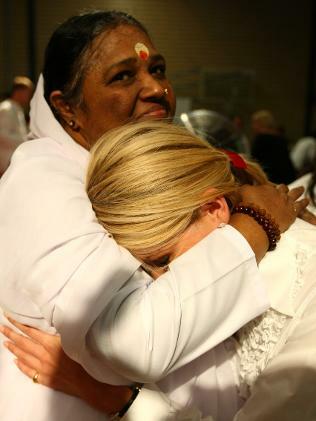 One day she met Amma.